Press and hold the Power button (right edge) until the wear24 logo appears (approx. 3 seconds) then release. 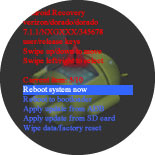 With the wear24 logo on-screen, short swipe from the upper-left toward the lower-right of the display to enter FASTBOOT MENU. Start your swipe from just inside the edge of the display (as shown). If the Fastboot menu doesn't appear (after the Wear24 logo disappears), press and hold the Power button until the watch resets then try again. 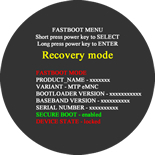 From the FASTBOOT MODE screen, select Recovery mode. Short press the Power button to cycle through the available options then long press (approx. 3 seconds) to select. 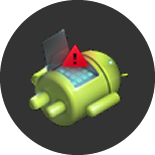 From the Android system recovery screen (image of an Android with an exclamation mark), press and hold the Power button for 2 seconds then release. Swipe up or down to cycle through the available options and press the Power button to select.